Once you have achieved the necessary Planning Permission (PP) and/or Listed Building Consent (LBC) for your property, or if your development is permitted without local authority approval, you will need to obtain Building Regulations approval for its construction. Building Regulations deal with life safety issues such as fire escape, ventilation and structural integrity and environmental issues such as thermal integrity and efficient heating systems. There are two routes to prove compliance with Buildings Regulations, by submitting an application to the Local Authority Building Control or by appointing an Approved Inspector. A Building Control Officer (Building Inspector) works directly for your local authority. An Approved Inspector is an independent consultant who is qualified to approve Building Regulations drawings and make the official site inspections, on the local authority’s behalf. Their workload – one might be able to check your plans quicker than the other. Their relationship with you and/or Hayes & Partners. For example, you may have worked with a specific person before and would like to again. 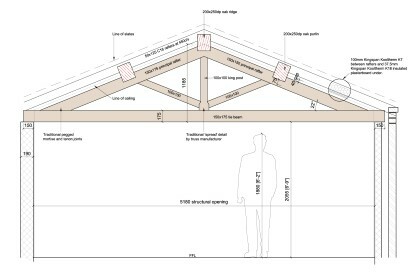 A Full Plans application comprises the submission of drawings and structural calculations for checking by an inspector before construction starts on site. The main benefit of a Full Plans Application is that it can identify potential building issues early, and allows time for details to be corrected prior to work starting on site. This avoids abortive work – giving you peace-of-mind, and crucially saving time and money. Hayes & Partners will review the scope of the construction work you wish to complete and write to you confirming our fee for producing Building Regulations drawings. These would comprise general arrangement layouts, construction notes and limited details required to secure building regulations approval only. Although a builder may be able to construct the project using the building regulations drawings, further details would in most cases be required to complete the work. It should also be noted that a Building Regulations pack comprising drawings and building notes does not constitute a full set of construction information and should not be treated as such. In addition, you will need to appoint a Structural Engineer to produce the structural calculations necessary to prove compliance with the Building Regulations. Hayes & Partners would obtain quotations for this service and then appoint a specialist on your behalf. Where proposals are particularly large or complicated you may also need to appoint a Services Engineer (drainage, heating, plumbing, etc). Again, we can obtain quotations for this service and appoint on your behalf. Once all of the relevant drawings, details and calculations required to prove compliance are complete we will submit them for approval by either a Building Control Officer (Building Inspector) or an Approved Inspector. A plan checking fee is payable for at this point. Before construction starts, a second fee is payable for either the Officer or Inspector to carry out site inspections at significant and predetermined stages of the build. During the inspections they will check that the works are being carried out in accordance with the approved drawings. Once the building work is complete, and Building Regulations compliance has been proven by the submission of the appropriate calculations and testing certificates, the Inspector will issue an Occupation Certificate. For a Full Plans Application, the time it takes to produce the drawings and specifications vary on the scale and complexity of the project. Typically, for a medium-sized domestic project, a period of six to eight weeks allows for coordination with structural engineers or other specialist consultants before a submission is made. Once received by either the Building Control Officer or Approved Inspector, the Application usually takes six weeks to be checked and a formal response given. This route does not require the formal submission of drawings for checking before construction, however this can result in abortive work, such as demolition and rebuilding if the work does not comply with the Building Regulations. A Building Notice should only be used where projects are small and simple (e.g. minor domestic alterations). You should also be confident that your builder has sufficient experience and excellent knowledge of, and can comply with, the Building Regulations. Prior to construction, we or your Approved Inspector will submit a Building Notice Form to the Local Authority. This form notifies the local authority that work is about to begin on site, and if an Approved Inspector has been appointed, that they will undertake the inspections on site. You will also need to pay a Building Notice fee (equal to the cost of the Full Plans Checking Fee and Site Inspection Fee) which allows for either a Local Authority Building Inspector or your Approved Inspector to undertake site inspections at significant and predetermined stages of the construction process. Although this route does not require it, your inspector may still ask the builder to provide structural calculations or details to prove compliance. They can also request completed works to be uncovered for inspection and the demolition and re-building of non-compliant work.